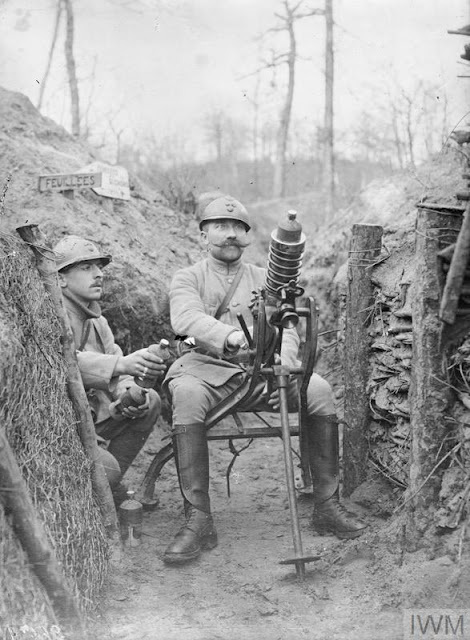 daily timewaster: French gunners (of the 73rd Regiment) manning a trench mortar in a trench in front of La Ville-aux-Bois-les-Pontavert, 8 February 1916. French gunners (of the 73rd Regiment) manning a trench mortar in a trench in front of La Ville-aux-Bois-les-Pontavert, 8 February 1916. Ok, only the French would rest a mortar in their crotch. There must be a better way to fight a war. Ok, yes, I know there was/is. But that was supposed to be the war that ended war wasn't it? Awfully clean uniforms and boots for all that mud. For some reason that mustache and mortar makes me think of that campy Flash Gordon movie with the score by Queen and Brian Blessed playing the king (or whatever, leader anyway) of the Hawkmen. Looks like they are shooting some Red Stripes over to the Huns.